There are a lot of successful businesses that are not the largest or the least expensive in what they sell. I think of Zappos and their success, and I think of Dunkin’ Donuts whose popularity has surpassed Starbucks in many markets. So what makes customer loyalty? Most likely its performance, reliability, offering something different which is worthwhile to the customer, and providing service far above what is commonly expected. Last Friday I had dinner with some friends from Boston. The son and his father are very successful businessmen; so successful they arrived at La Trattori Restaurant in Palm Beach Gardens in a bright red new Ferrari. I can’t deny I wasn’t impressed with the beautiful car, and as dinner progressed the conversation about brand loyalty moved ahead. And how did that just happen to come along? Naturally the conversation drifted towards cars. We reminisced about our first cars when we were teenagers; seems that most of us had American budget cars with an occasional Toyota; possibly of today’s equivalent to the Toyota Yaris, but nevertheless none of us ever felt much loyalty to any of these manufacturers as we grew older and had more substantial incomes. As we grew up however, certain cars became more attractive. It wasn’t just the Toyota; it became the Lexus I wanted to drive. It wasn’t the Honda; it turned into the Acura, and the Nissan became the Infiniti. Obviously the improvement of the car manufacturers brand made a big difference in our automobile purchasing preferences. Yet to me, a moment of automotive epiphany happened when my salad fork fell to my lap the moment Mitch told me the Ferrari was his son’s car, and he drove a Hyundai. I remember Hyundai cars as those ugly Korean made cheap cars sent over 25 years ago that I wouldn’t even pay attention to the dealership where they were sold. I would have worked a second job to make the payments on a “nice” car before ever driving a Hyundai, and now – a new brand and “New Thinking. New Possibilities” almost takes center stage. Hyundai pushed onward and outward where other car manufacturers wouldn’t or couldn’t dare to go as the economy sank to the basement. With their introduction of better looking cars such as the Santa Fe, Tuscon and Genesis, people started paying attention to the styles now comparable to their competitors, but still offering better prices. Then came the customer service; a ten-year warranty or 100,000 miles. There was more. Hyundai developed a national campaign for buyers who lost their jobs; the customer could return their car with no penalties. In 2009, Hyundai surprised the industry with their Assurance Gas Lock program promising to subsidize rising gas prices for their customers. Hyundai basically reinvented themselves and made their product better. According to the July issue of Motor Trend Magazine, an extraordinary “six percent of American Express ‘Black Card ‘ Centurion Card holders have a Hyundai in their garage.” ($1.3 million average annual income) If you’re wondering what’s popular in the Hyundai choice, it’s the Equus, the luxury sedan with prices starting at $58,900. The company prides itself on its outstanding service and its customer attentiveness. Let’s face it – they’ve come a long way since that ugly little box I remember in 1986. Good insight! I commonly think of how Hyundai has greatly developed its brand over the years. When I recall my early memories of Hyundai, it was the adds for the $4,995 Accent that I saw. 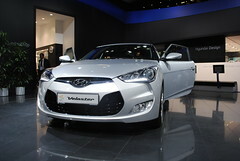 Now, its the maker of a car i want to acquire as a grow professionally, a Genesis. Great read! I really like this post, it made me really think about why customers choose to come to one place over another and it really is that loyalty that they give to them.